These are beautiful Soulangiana Magnolia flowers painted in shades of beige with pink highlights, bright green leaves and brown stems. 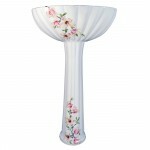 Looks great on the Bali pedestal with it's scalloped edges and decorative styling. 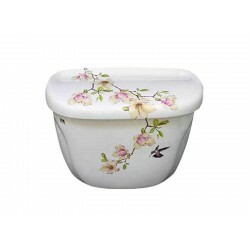 Very nice addition to the powder room with the flowers on the sink. I know that sounds a bit weird but I'm trying to write longer descriptions to improve SEO!!!! 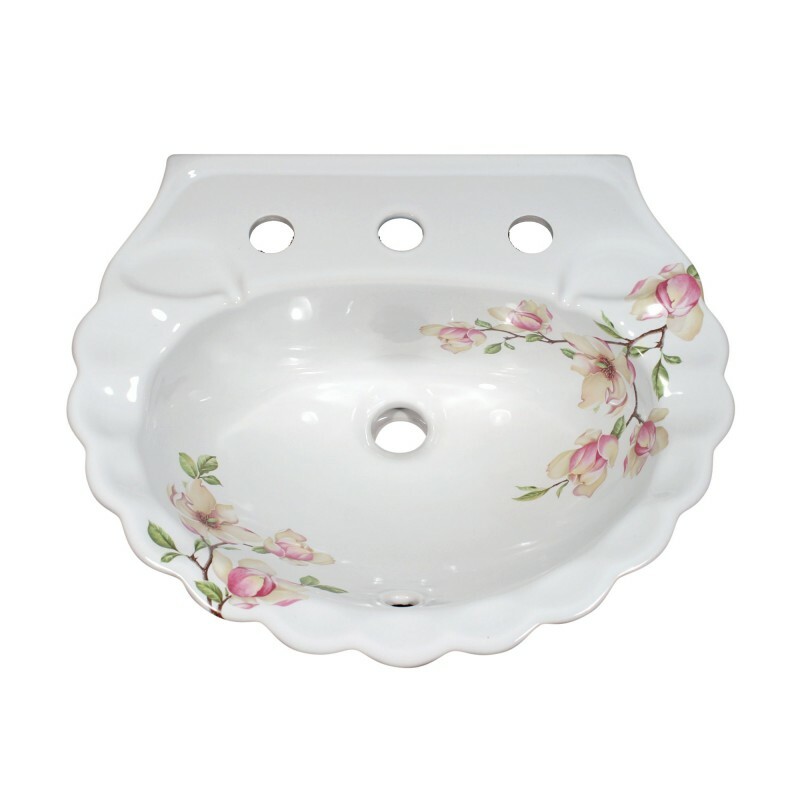 Note: The photo of the bowl is a little more accurate, the main image of the whole sink is a bit too light. 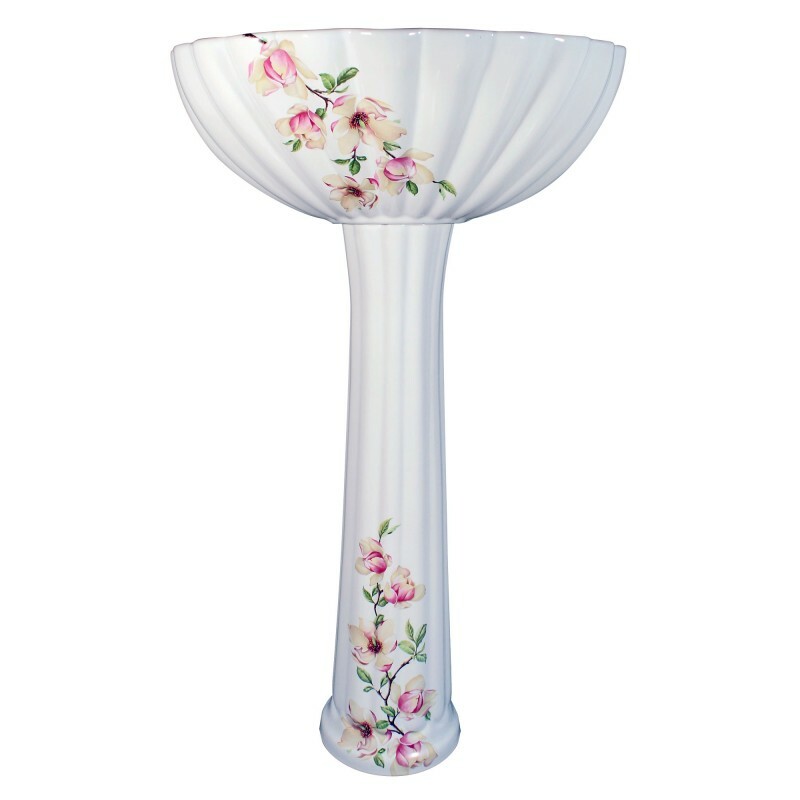 The Barclay Bali pedestal measures 20" wide x 16" deep x 35-5/8" high. (View specification sheet here). Looks great on white or biscuit. This design can be adapted to many pedestal sinks, visit the Fixture Choices page or call for info. 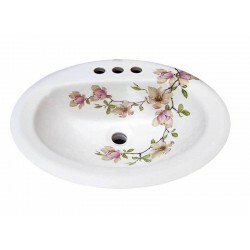 These sinks that Lynne makes are probably the most beautiful sinks I have ever seen. I bought one, that I love, and have another one on my wish list. I have not yet installed the one I bought, but always include it as one of the prize pieces on my friends and family house tour. Everyone who I have shown it to, loves that sink! It is so beautiful. I actually have planned the whole bathroom around it. That one piece that will be the focal point of the whole room! Lynne's sinks really lift the level of beauty of a room. They are worth every penny. You will get many years of enjoyment from looking at her sinks. Also, her customer service is great. She is very personable and when she noticed that a product that she was making for me was flawed, she immediately contacted me and let me know that she planned to re do it until she was happy with the result.